The Griffith family Buick decorated as the "Dove of Peace". 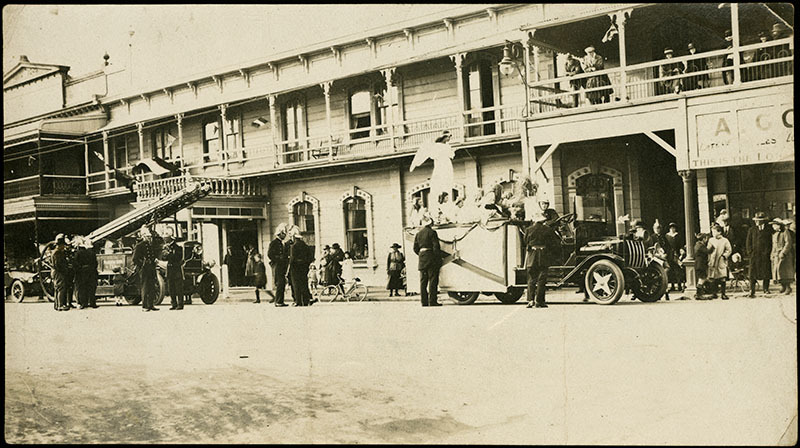 See the Taranaki Daily News edition for 21, July 1919 for a recap of this parade. Peace celebrations were held on July 19-21 1919 in Palmerston North. On Saturday 19th of July at 9.30am, a 21 Gun Salute under the direction of Col. McDonald was executed. Later speeches were given at the show grounds. On Monday - Children's Day, 21st July - as a procession was undertaken through Palmerston North to the Showgrounds, 500 pigeons symbolising peace were released from the oval.